Goss Products experience makes the difference. 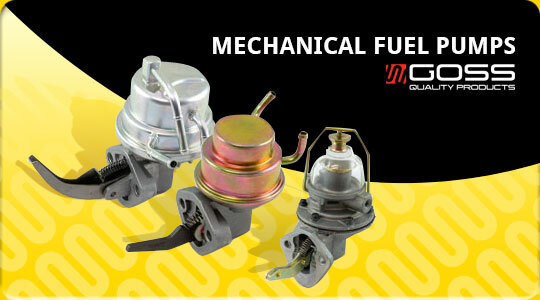 Goss is well known in the Australian Automotive Aftermarket for its genuine quality direct replacement fuel pumps. All Goss fuel pumps are supplied with the correct strainer to do the right job first time. The Goss range covers Mechanical Fuel Pumps and Electric Fuel Pumps, along with a range of Pump Repair Kits, Gaskets, Hoses and Carby Kits. AVAILABLE TO ORDER ON-LINE SEE BELOW ! For nearly seventy years, Goss has been designing, developing, manufacturing and distributing original equipment, quality fuel system products to the Australian Automotive Aftermarket. Established in 1943 as the Goss Gasket Manufacturing Company Pty Ltd Goss was instrumental in the development of a more durable and petrol-resistant, flexible diaphragm material in the 1940s. During 1947, Goss utilised this material in the manufacture of automotive mechanical fuel pump repair kits and began production of complete fuel pumps in 1957. In 1960, Goss became a member of the GUD Holdings Group of companies, a group which now includes such diverse operations as GUD Automotive (Ryco Filters), Sunbeam, Davey Water Products, Dexion, Lock Focus, and Oates. Since 1962, Goss has been developing, manufacturing and supplying fuel pumps, pump repair kits and components to vehicle, agricultural, engine and equipment manufacturers, as well as to the automotive aftermarket. During the mid 70’s to meet market demand, Goss began to import fuel pumps for the ever widening range of vehicles in the Australian marketplace, mainly from original equipment manufacturers. A range of bulk automotive hose, with a complementary range of hose clips and clamps, was progressively introduced between 1975 and 1984. During the early 1990s, Goss introduced a comprehensive range of OEM quality 'steel top' replacement pumps to reduce the cost of mechanical fuel pumps. Traditional repairable pumps remained available for the specialist and DIY market. With the introduction of electronic fuel injection (EFI) systems on mainstream vehicle models in the 1980s, Goss introduced broad ranges of both in-tank and external fuel pumps in 1993. Carburettor tune up kits were introduced in 1994 to widen the variety of Goss automotive fuel system products. In 2003, market coverage of EFI pump applications was further increased by consolidating the popular 38mm turbine fuel pumps and adding an electrical connection adaptor to cover the 4 different OE connection types in use - less part numbers covered all existing applications, plus over 30 new applications. For 2007, the range of EFI fuel pumps and modules was rationalised and increased to cover all mainstream vehicle models, and 6 and 24 volt universal fuel pumps were added to expand the 12 volt range. In 2009 Goss Products ceased manufacturing and was amalgamated into the GUD Automotive joining another automotive aftermarket brand – Ryco Filters. In order to leverage the well established product development, engineering and sales and marketing support. In June 2012 GUD moved into new purpose built offices and warehouses that includes a state of the art laboratory and workshop facilities. A chemical welding compound for the repair of cracks in valve ports, water jackets and cylinders of automotive internal combustion engine castings. Chem-I-Weld is not a temporary cure but and efficient and Permanent repair that Requires No Disassembly. Simply pour contents into radiator and run engine at a fast idle for approximately 20 mins (refer to bottle for specific details). It is important that the cooling system is clean and free from other additives before using Chem-I-Weld. Use the vehicle normally for approximately 1 week, drain and flush cooling system and fill with clean water. Add Corrosion Inhibitor, Anti-Freeze or other desired additive. Chem-I-Weld is effective on cast iron, steel and aluminium and will withstand high temperature and water pressure. Chem-I-Weld is Not a radiator repair preparation nor will it repair gaskets or seals. Chem-I-Weld another great product from Goss. The stick with 1000 uses. A dry lubricant in a handy stick form. Simply rub it on - lubricates; stop squeaks; prevents rust; does not soil clothing; loosens stiff doors, windows, drawers; assists driving of nails into hardwood; eliminates squeaky fan belts; ideal for a variety of marine, building, engineering, automotive and handyman applications. Look up your Goss Fuel Pump Part Number! CLICK TO VIEW THE GOSS PUMP CATALOGUE! How do I order my Goss Fuel Pump? Step1: Simply look up the correct pump using the link above. Step2: Do not proceed to Step3 until you have done Step1. 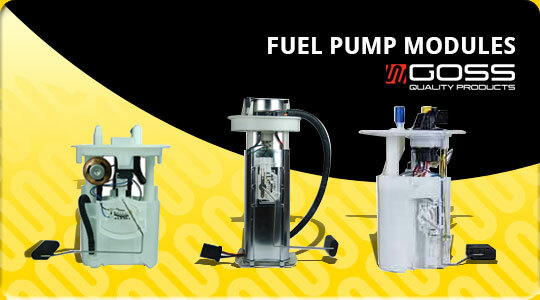 at our on-line shop to locate and order your fuel pump quickly and easily! 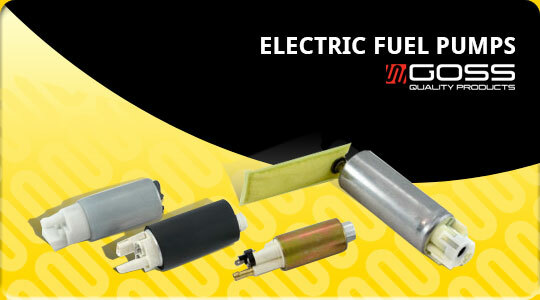 We can ship your Fuel Pump for your vehicle today !! 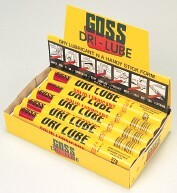 See Noel Comerford's Auto Parts your Goss distributor for all Premium Quality Goss products.